Now that spring is upon us, it’s time to get the yard back in shape for the next seasons. You might have a downed tree in your yard or one that needs to be felled. For these situations, you need to remove that tree from your property. Otherwise, it constitutes a real safety hazard, because it could fall on its own and cause property damage or even bodily damage. And, if it’s already fallen, it’s going to damage the lawn and be a possible fire hazard. But with some a simple step-by-step downed tree removal protocol, you can effectively deal with it. When you’re dealing with a downed tree or one that must be cut down, you’ll need to practice yard waste hauling safety tips. Be sure to keep tools organized so they aren’t a tripping or another kind of safety hazard. Also, keep your pets and children inside. There’s no good reason to allow kids or pets outside when you’re taking care of a downed tree or one that needs to be cut down. Additionally, break things down into small sizes to be more manageable. Survey the area. Before you start cutting the tree down, it’s very important to survey the area around you. Should any power lines or structures be within the radius of the tree’s height, do not cut the tree. Call in a professional arborist instead to deal with it. Choose a falling direction. Next, if you need to cut the tree down, you’ll need to pick a direction to fell it. If possible, this direction should be the same way the tree naturally leans or is now leaning. Clear a path in the opposite direction so you can quickly move away when it falls. Make the first cut. The first cut into the tree will be vertical, slanted at about a 70 degree angle on the same side of the felling direction. Cut into the tree with a chainsaw, about two feet long, inserting the chainsaw into the trunk and cutting downward and slightly inward into the trunk. Make a second cut. Now, you’ll stay on the same side and make the second cut, in a horizontal direction to meet the vertical cut where you stopped. This will create a notch and help to cause the tree to fall in the chosen direction. Make the felling cut. Make the last cut, starting on the opposite side of the trunk. 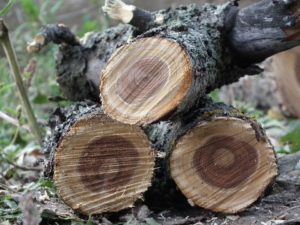 The felling cut is also horizontal and should be just a few inches higher than the other horizontal cut on the other side of the trunk. As you cut, watch the tree, when it begins to fall, carefully back away. If you need help with yard waste removal, go ahead and phone 800-433-1094 or visit Junk Garbage Removal. We’ll come right out to your property, clean it up, and haul all that stuff away for you.